How to Care for Your Avocado Tree in the Winter - AvoSeedo - Grow your own Avocado Tree! There aren’t so many people out there who don’t love avocados, and that vast number includes those who live in the city without gardens. It also includes people who live in places that can reach subzero temperatures. Should these conditions stop you from growing your own avocado trees? Absolutely not! You just need to be a little clever about it. The price of avocados, like many other foods, just keeps on creeping up. As there’s no chance of us dropping these delicious, nutritious fruits from our diet, it makes sense to bite the bullet and grow our own. Fortunately, that’s a relatively easy task and can be done inside or outside the home, dependent on the avocado variety and your location. The avocado growing challenge comes when you’re living in a region that gets sub-zero winters. Your poor avocado tree can’t withstand those temperatures any more than you could without your ultra-warm winter clothes. Your tree is going to need a little more TLC too during the wintertime if it is to keep offering up its mouthwatering fruits. As the avocado tree originated in South Central Mexico, its natural environment is a warm one; so that’s what it needs in order to flourish. After being a dietary staple in the Americas for thousands of years, by 1750 the avocado was so popular that it found its way to Indonesia; by 1833 it was in Florida, in 1908 Israel, and by the late 1800s it was even part of the Australian diet. One thing these countries have in common is climate; although some may see temperature dips in the winter months, avocado trees can still thrive with the right care. If you live somewhere like New York, for example, you’ll have the benefit of warmer temperatures for your tree during the summer months. But when the winter comes around, you’ll need to bring it indoors. With this in mind, you’ll need to plan ahead by seeding the right type of avocado. There are literally hundreds of different types of avocado, but if you care about its survival, you’ll need to weigh up the variables of your location and choose your tree type wisely. Sometimes even an overnight cold snap is enough to damage your avocado trees. This is especially the case for young or unprotected trees. If your tree is going to spend a lot of time – or all its time – growing outside, take measures to avoid frost damage by picking a type that can handle the cold better, and sufficiently enclose it (or bring it indoors) when the temperatures drop. Which option you choose depends on the drop in temperature and cold-hardiness of the avocado type you’ve got. There are three main avocado types: Mexican avocados (Persea americana var. drymifolia), Guatemalan avocados (Persea nubigena var. guatemalensis) and West Indian (Persea americana var. americana). Of the three, Mexican and Guatemalan avocados are the best at tolerating the cold. If your region is subject to yearly freezes, however light, the Mexican avocado would be a prudent choice. Varieties such as Mexicola, Topa Topa, and the unusually named Bacon avocado may handle a temperature of 25 degrees Fahrenheit. The second contenders are the Guatemalan varieties, such as Rincon, Nabal and MacArthur, which should withstand 29 degrees Fahrenheit. Most other varieties will be damaged by temperatures under 30 degrees. If cold temperatures are on the way, it’s necessary to take measures to protect your trees. If you have young trees, you can construct a frame around them and cover the frames with heavy blankets that will break the wind and retain some warmth. For older trees, you can drape incandescent outdoor lights (such as those you’d put on a Christmas tree) around them to generate some heat. If a freeze is coming, it would be smart to harvest the current yield so as not to lose it. Worst-case scenario, the damage may happen despite your efforts. It could still be possible to save your tree with sufficient watering through the cold period. This can stop the frost from drying it out, and blooms that dropped in the cold weather may grow back. Don’t prune off damaged branches until you’re sure the coldest weather has passed. 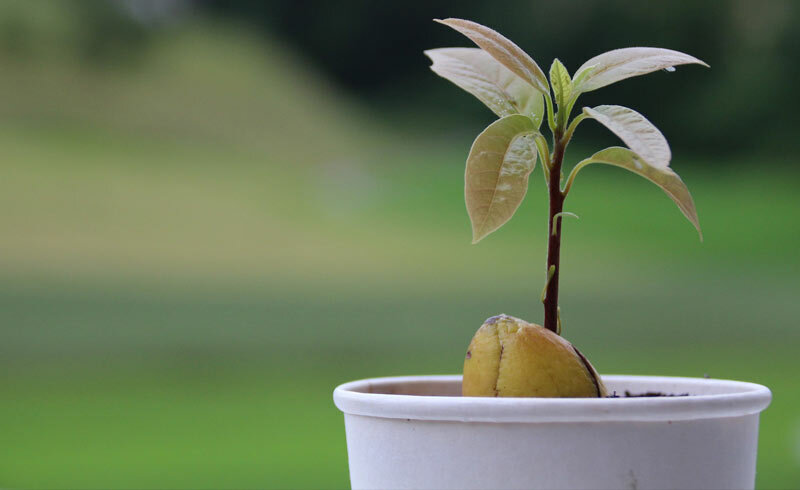 If you’re in a colder climate, it is smart to plant your avocado tree in a pot. This way you can move it around for maximum exposure to more favorable temperatures. If you have to bring your avocado tree indoors, it will have a better chance of survival and a worthy yield. Avocado trees make great houseplants; they also improve the air quality inside the home, they’re pleasant to look at and it’s fun to watch them flower, anticipating the yield! It’s still much more sensible to keep your trees outside when temperatures allow, otherwise they may not flower. As soon as the warmer temperatures come around, move your avocado trees outside into the direct sunlight. If you think you may need to care for your avocado indoors at any point, we recommend dwarf varieties like the Guatemalan Holiday, or Wertz, a hybrid variety from California. Holiday avocado trees tend to be smaller than Wertz trees. You can also consider a small variety like the Guatemalan Gwen avocados. Find out more about these avocado types here. Any of these trees make a good choice, as you can maintain them inside the home for many years to come. You will need to pay extra attention to your avocado tree when it’s inside. For a start, this means using a grow bag that matches the rooting size. Grow bags are a good alternative to standard pots because they allow more oxygen to reach the roots. You should ensure your tree is positioned where it will soak up the most sunlight (i.e. on the sill of a large window). You’ll need to carefully select nutrients and monitor the pH of your tree, and you should take care to prune it properly. Trimming a tree to half the size once it’s around a foot tall should yield a round and full tree. As it takes more effort for an avocado tree to produce fruit indoors, you can help the process along by pollinating and grafting. Some trees do self-pollinate, including the Gwen, Holiday and Wertz varieties; but you’re likely to get an even better yield by assisting the process. This is called cross-pollinating. Avocado trees have both male and female productive organs. The plant will often give many flowers – between two hundred and three hundred clusters – but you’re likely to get only 3 fruit from these. Avocado flowers come in two types: A and B. The types refer to the times when the male (stamen) and female parts (pistol) of the plant open up, and you’re able to pollinate. Type A female flowers are most receptive to pollen in the morning. But male flowers shed their pollen in the afternoons. Conversely, type B flowers do the opposite. The male flowers shed the pollen in the morning, and the female flowers open in the afternoons. That’s why it makes sense to cross-pollinate with the two different tree types; fertilization is much more likely this way. It makes sense to have access to both types if you wish to encourage your fruit yield. Type A trees include Gwen, Pinkerton and Hass. Type B includes Fuerte, Bacon and Zutano. As is the case with humans, the fertilized ovary produces the baby, or fruit. 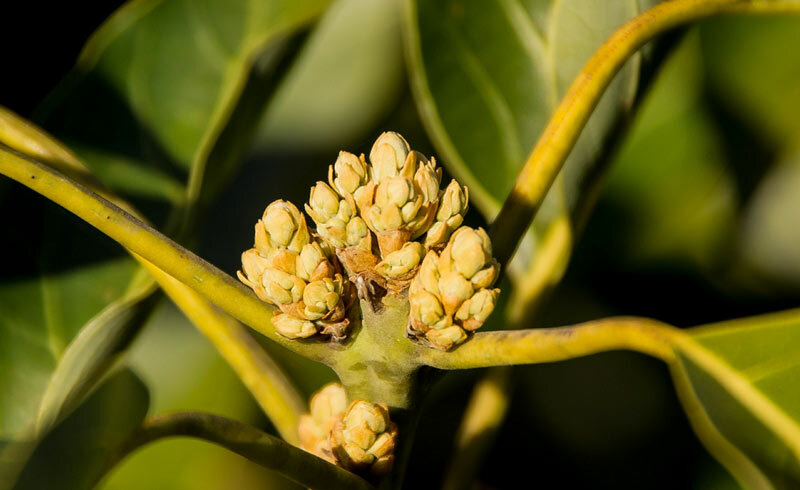 Although avocado trees love sunlight, a cool night will help the flowers to bloom. While your plants are outdoors, keep them twenty to thirty feet apart to increase the chances of fertilization. Indoor growing is often more successful if you graft your avocado trees. If you’re going to graft, it is a good idea to take an avocado tree that has previously born flowers and use this as the donor. On the tree receiving the graft (known as the rootstock), you can use a chisel to make a downward facing cut on the trunk, no more than halfway down it. Peel back the bark and insert the scion (young, green and sturdy branch) you cut from the donor tree, including the bud. Next, you’ll need to wrap the union with budding rubber and secure it with grafting tape. Make sure that no water is able to enter the cut, or it may rot. Bud unions will take anywhere from three weeks to a couple of months to heal, dependent on the season. Sunlight and water are the most important factors for your avocado tree, as is the case for most plants. You should be careful not to under or over-water it, or it will die. If the leaves are yellow, it’s had too much water. If they have brown, crispy edges, it needs a drink. Make sure the soil hasn’t become hard and dry; this is another indicator that your tree needs watering. If you’ve never seeded an avocado before, it’s fun to watch it grow. Our time lapse video will give you an insight into how simple it is to grow your own tree with AvoSeedo, our innovative and durable tool. It’s never been easier! If you need any advice on growing your own avocado trees, feel free to look around our informative site or message us for advice. How to Grow an Avocado Tree A Brief History of the Avocado How to get rid of white flies on your avocado plants Successfully growing avocados in a pot Avocado and Its Different Breeds How to grow cress in your leftover avocado shells How Many Avocados Do You Need Per Week For Long Life? How Long Do You Spend Looking at An Avocado Toast in Instagram? This entry was posted in All about Avocados, Gardening and tagged Avocado, avocado winter, care for avocado, indoor avocado, pollinating avocado, protect avocado tree, right type of avocado, water avocado tree.